Many relatives will agree that I was born a rebel kid. But in the real world and in my work place, I have come to accept that the traditional practice, in general, is the best way to make things work out(due to the power of the majority's acceptance). For me then, I'm sort of just enjoying the less exciting traditional world in pretense. Rebellious Bride Ses may be familiar to you guys because we previously blogged about her awesome black bridal gown. Their Ocean Park wedding may also be familiar because of a separate feature we've done for Rebellious Bunch - Passion Cooks. But there's just too many rebellious goodies from this wedding that we were more than glad to have received this follow-up submission from Ses. Being dolled up in a dramatic water view, being wed in the presence of family, friends, an officiator, and SHARKS-- that's Ses & Ben for you. Truly a rebellious experience to have been part of! Rebellious Brides: What makes you a rebellious bride & groom? Ses: Yes, you can say that our wedding was way too much of a rebellious one. It was planned to really not let traditions limit us-- to uniquely express our self in an unconventional wedding practice. We also took our special day as an opportunity to strongly define ourselves--showing our relatives and friends who we really are as a couple. I decided to go for a BLACK wedding dress (click HERE for related article) while my hubby was in a black suit and dark gray tuxedo shirt. We did do away with a wedding planner, declined having a shower or stag party, had a glimpse of each others wedding outfits before the ceremony, and stayed together the night before the wedding. My two sisters were even our ring bearers--really odd I know, but it was exciting and we didn't want things done the traditional way. I walked down the aisle alone with just a brooch bouquet clutched in my hands, while my groom walked down with his brother. Our guests were requested to come in blue or yellow outfits, and we agreed that jeans are allowed. RB: Why did you decide to make your wedding rebellious? Why in Ocean Park? 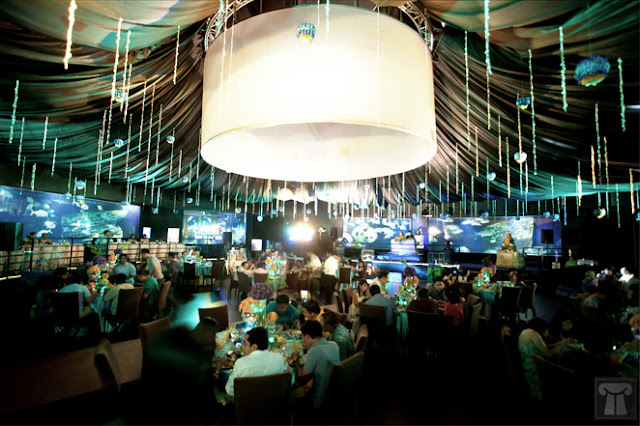 Ses: To manage our expenditure wisely and keeping in mind our guests' convenience, we were forced to consider other venues instead of the original Boracay beach wedding plan. Considering that our wedding's date fell during holy week, the beach crowded Boracay at that peak season wasn't desirable for a wedding. Ben & I decided to just give up the Boracay idea and find another place within the Metro. This then lead us to check other venues such as Manila Yacht Club, Diamond Hotel until we came across Manila Ocean Park. 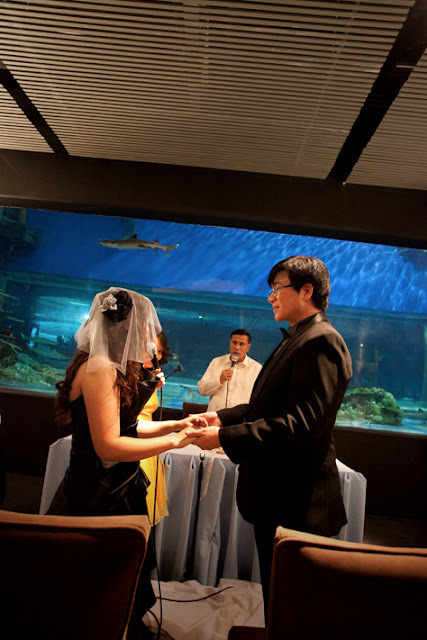 It was on that day, the first time we stepped inside the Oceanarium in Manila Ocean Park, when we were both like: " YES, This Is It!" We started seeking the talented service of Maja from Passion Cooks Catering to conceptualize a nautical and beach wedding theme, but we later realized that our decision to do the wedding in Ocean park would be better off with a bit of a whimsical vibe. 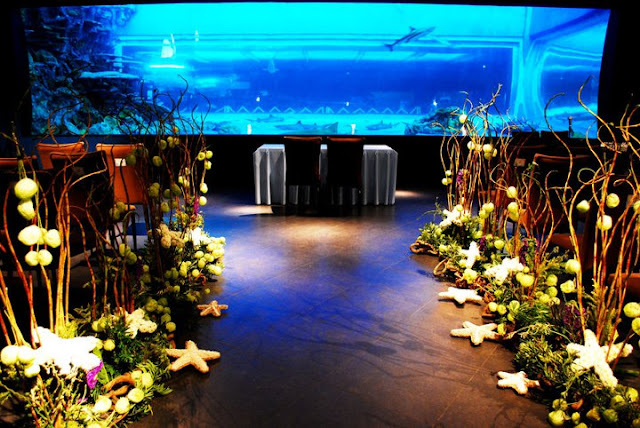 With a "Rebellious flair" of her own, Maja came up with the idea of minimal flowers for the decor setup and opted for a deep ocean marine environment, set against the many aquariums and huge windows all over the Oceanarium walls. 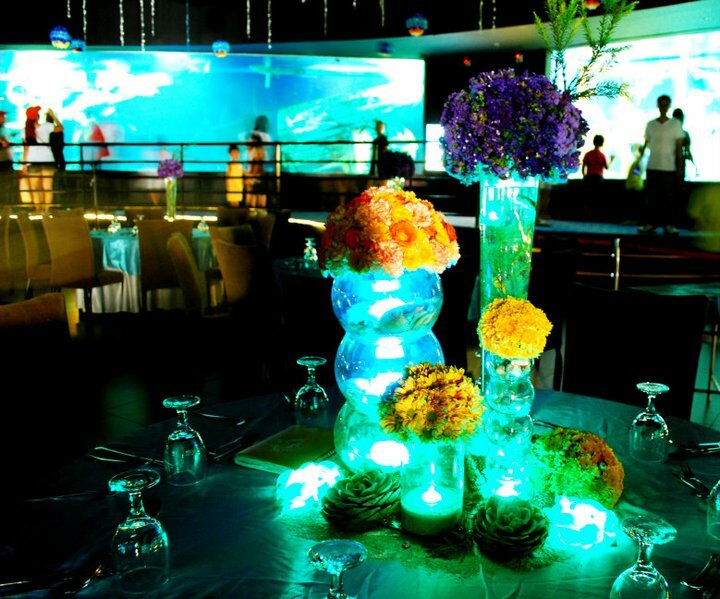 Since Manila Ocean Park's management restricted the used of candles, Maja cleverly substituted them with tea lights and submersible LED lights for all the tables. The ceremonial hall design was again an amazing work done by Maja's own creativity & imagination. She and her mom Tita Laura Martinez were my best partners during our wedding preparation, their well prepared menu for the dinner tasted excellent to the point that our guests kept on asking for the Food Caterer's name. 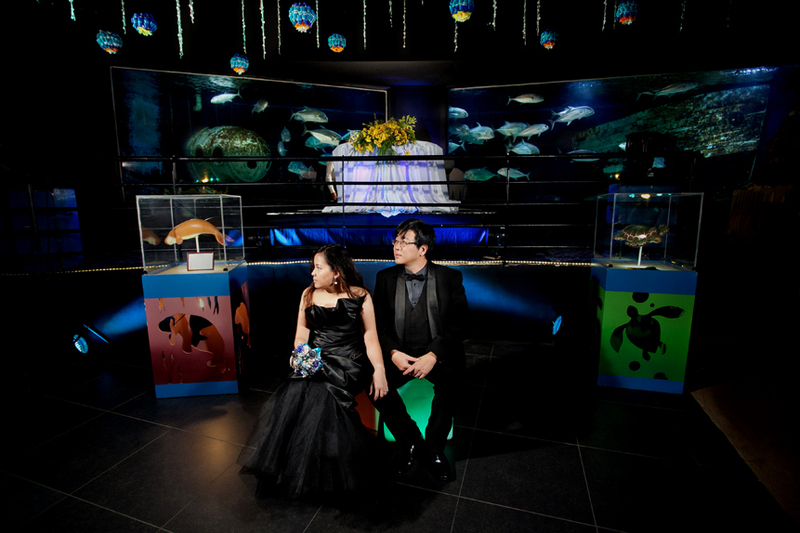 The over-all astounding setup truly did impress all our guests. Ben & I will never regret the decision that we had made choosing Passion Cooks Catering over the accredited caterer of MOP! RB: What advice can you give to brides who may be having second thoughts about having a creative wedding? Ses: Plan and organize, yet remember not everything will go flawlessly and that's fine. Learn to ignore some of the lapses that are inevitably part of the preparations. Learn to accept that people are going to have criticism - that sometimes people are afraid of odd things. A wedding is a celebration of the love between two people and the most heartfelt way of representing it is by having a ceremony that truly reflects who you are as an individual and as a couple. Thank you so much for featuring my wedding. We truly appreciate it. I know it took us a little time to finish our details but I'm so glad that you graciously accept and posted it to your blog. Kudos to all rebellious brides! Wow! We are so happy to know that! Yey! Thank you so much for this. It's an honor to be featured on your website. My fiancee is one of your top followers.